Liberty running back Matt Webb looks for running room during a game earlier this season. To get to the final four, in any sport at any level, a team has to have the ball bounce its way a time or two. Sometimes, though, teams are just so hot they don’t need to catch many breaks. The Olentangy Liberty and Mentor football teams — set to square off in today’s Division I state semifinal at Mansfield’s Arlin Field — are two sparkling examples. The Patriots (11-2), winners of eight straight games, have outscored their three postseason opponents by a combined margin of 86-21. They racked up nearly 400 yards of total offense (390) and held Whitmer to just 127 in last week’s 34-7 regional final romp. They beat Gahanna Lincoln 17-14 the week before that and cruised past Dublin Jerome 35-0 in their opener. Mentor, though, has been getting it done as well. The Cardinals, who are making their fifth trip to the final four, have won 11 straight, including back-to-back thrillers over St. Edward (21-13) and St. Ignatius (23-21). They have two 1,000-yard rushers in Eli McDougal (1,062 yards and 11 TDs) and Chris Edmond (1,038 yards and 20 TDs) and a talented line to complement them. Ryan Jacoby and Tyler Schonauer are 260 and 265 pounds, respectively … and they’ve been dominant in recent weeks. Oh, and Mentor is fully capable of moving the ball through the air as quarterback Tadas Tatarunas has thrown for nearly 3,000 yards this season (2,976 and 29 touchdowns). Logan Shea (68 catches for 905 yards) has been his favorite target. The Patriots, who are making their second straight trip to the final four (lost 24-14 to St. Ignatius last season), will counter with a balanced attack that has been just plain dominating lately. Liberty averages 146 rushing yards and 149 passing yards per game. 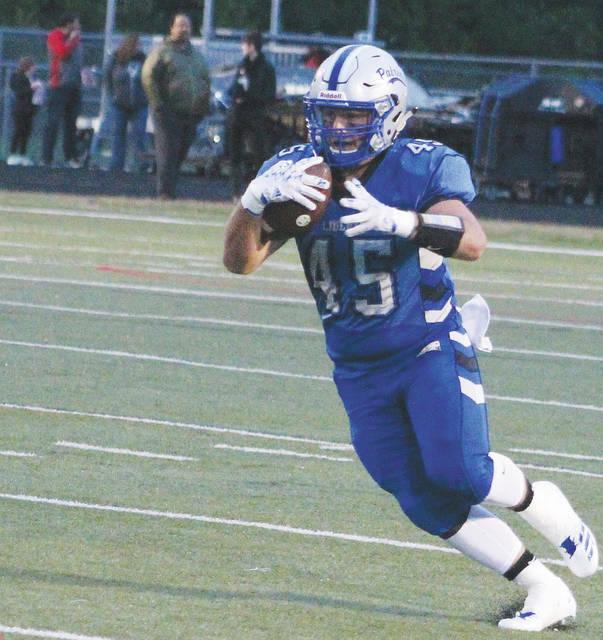 Matt Webb, who ran for 161 yards and a pair of scores in last week’s win over Whitmer, has rumbled for more than 1,000 yards this season with 12 touchdowns. The passing game, meanwhile, has been an extension of that running game, with short, quick passes setting up the occasional shot downfield. Following last week’s efficient effort (9-for-14 for 155 yards and three TDs), quarterback Mitchell Okuley has thrown for a total of 1,884 yards to go with 24 touchdowns and 11 picks. His top target has been Ben Roderick, who has 45 grabs for 551 yards and 14 touchdowns. Liberty’s been efficient, to say the least, and Hale said staying that way will be key against Mentor. Kickoff is set for 7:30 p.m.